Don’t put off retirement planning! The earlier you start saving for retirement, the more time your investments can accrue value. Time is one of the most effective tools in your retirement savings arsenal. Make budgeting priority number one — then discipline yourself to stick to your budget. Create an annual budget and break it down into monthly budgets. At the end of each month, evaluate how you did: What worked and what do you need to improve? Track your spending as you go and continuously look for ways you can spend less and set aside more for savings. If your employer offers a retirement plan, take full advantage of it: contribute the maximum amount possible, and if they offer a match, try to get more money into the market earlier in the year. For 401(k) and 403(b) plans, you can contribute up to $18,000 in 2017 — or $24,000 if you’re at least age 50. These contributions are tax deferred, meaning they go in before taxes are withheld, but you pay taxes on withdrawals once you retire (and if you take the money out early you pay an additional penalty). The taxes work in reverse order with a Roth IRA — no taxation on withdrawals, which can mean even greater tax savings on money invested long term. With these plans. you can contribute up to $5,500 of after tax money if you’re under 50 and up to $6,600 if you’re 50 or older. Another viable option here if you’re looking for ways to get more while you’re in retirement, is accessing your home’s equity by getting a reverse mortgage. This can be tailored depending on what works best for you. In order to make the maximum contributions to a retirement plan, you need make your retirement plan the first thing your money goes toward after rent and utilities. If you get paid every two weeks, allocate as much of your non-rent-paying paycheck as possible toward your retirement savings — even if it means manually adjusting the contribution amount twice a month. Whatever you have left after that becomes your budget for food and other living expenses. Put an end to the cycle of debt that student loans might have started for you. Pay off your credit cards, close the accounts, and switch to debit cards. Prioritize paying off all other debts if you can. Ideally you would only have only an auto loan and mortgage after that. Hopefully, this will force you to live within your means. When you stop buying things you don’t need, your life will become simpler and you’ll find it easier to save for retirement. Try to set aside money for emergencies so that you don’t have to dip into your retirement account or borrow in order to cover any surprise expenditures. This will save you from having to pay penalties or interst on any borrowing. 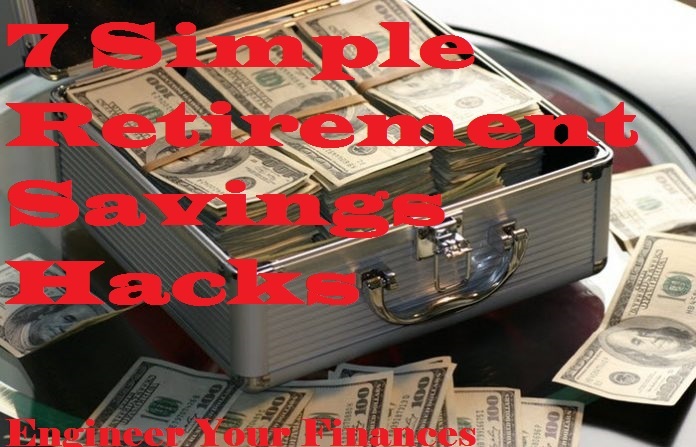 The tips mentioned above are really basic ways to hack your retirement savings. Of course, there are always more ways to increase your savings. Make a hobby out of learning how to set aside more money for the future, and commit to implementing what you learn.